God knows you personally. He knows when you sit down and when you get up, and what you are thinking and what you are going to say before you even say it. 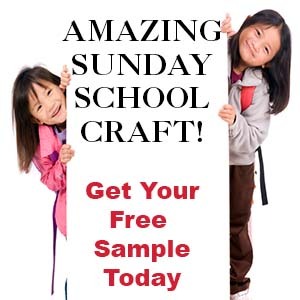 As your children work on the coloring sheet talk to them about how God knows everything about them such as, "He knows everything they are thinking and everything they are going to say before they even say it." 1. Before class print out the pages, cut them apart and staple them together according to the directions for Itty Bitty Books. 2. In class have your children color the pictures and practice reading the book. Talk about the pictures and how God knows everything about them. Preparation: As your children arrive, have a helper help them answer some questions about themselves and write them down on a piece of paper. How many sisters and brothers do you have? What is your favorite television program or movie? I hope you all learned a little bit more about each other, and that your classmates know you a little better. We all like it when people know who we are, and have friends who pay attention to us and care about us. We all like to be noticed, and to feel loved and important. Sometimes we get jealous when we see other people getting more attention. For example, if you have a brother or sister, you might feel jealous when your parents seem to spend more time with him or her. Even in school you would like to be noticed by your teacher. But it is hard for a teacher to pay attention to everyone all the time because there are a lot of kids in a class. Everyone wants to be included in a group. It feels bad when no one pays attention to you, or wants to play what you want to play, or if others don't seem to care what you have to say. We all feel lonely or left out sometimes. But when you think about how much God loves you and cares for you, it can help you to feel better. The Bible tells us in Psalm 139 (Open your Bible and read the first verse), "O lord, thou hast searched me, and known me." Even if no one seems to care about you, or pay attention to you, you can know that God sees you and knows you. It says in the second verse, "Thou knowest my downsitting and mine uprising, thou understandest my thought afar off." That means that God knows when you sit down, when you get up, and he knows what you are thinking. It says in verse three, "Thou compassest my path and my lying down, and art acquainted with all my ways. That means that God knows when you go somewhere and when you come home, and he knows how you feel and act. He knows what you will say when your mother tells you that you are going to have spinach for dinner. He knows what you will do when your mother tells you it is time to take a bath, or when you have to go to school. God even knows every word that you are going to speak, and the words you are thinking and didn't say. "For there is not a word in my tongue, but, lo, O LORD, thou knowest it altogether." "Thou hast beset me behind and before, and laid thine hand upon me." God is everywhere --behind you and in front of you. Jonah found that out when he tried to hide from God. 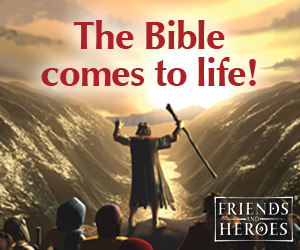 Do you remember the story of Jonah and the whale? He tried to hide from God, but God was right there in front of him and behind him. Does that all seem hard to believe -- that God could know you so well? The author of this Psalm thought so too. He said, "Such knowledge is too wonderful for me; it is high, I cannot attain unto it." He said that it was so amazing that he had a hard time believing it. It is amazing that God could know us so well and still love us any ways. He knows everything about you, the good stuff and the bad, and he still loves you. That is wonderful, isn't it? ©2010, Digital by Design, Inc. - See Copyright Information- Do not publish a copy of this lesson anywhere on the web. Play "I'm thinking of an Animal"
Remind your children that God knows everything about them, even what they are thinking. Say, "Wouldn't it be interesting if we could know what everyone was thinking. We are going to play a game, and try to guess what each other is thinking by asking questions. Have one child think of an animal and take them outside the room to tell you what it is. When they come back in the room they should say, "I'm thinking of an animal." And the children should take turns asking a question to find out what animal the child is thinking about. Once a child asks a question, he gets to guess what the animal might be, and then the next child gets to ask a question. The child who guesses right is the next child to think of an animal. If you have older children, you can have them write down the animal they are thinking before they start. Make sure you know what the child is thinking before they start because they may change the animal if someone guesses too soon. ©2010, Digital by Design, Inc. - See Copyright Information - Do not publish a copy of this game anywhere on the web. 2. Fold the papers in half and cut on the diagonal lines. 3. Cut strips of paper 7 1/2" x 1" from different colors of paper. 4. In class have the children weave the strips into the paper pattern and then glue of tape the strips in place. God knows everything about me - Pointing to self. He knows who I am and what I'll be. He sees me when I sit and when I stand - Sit and then stand. He holds me in his hand- Stretch out hand with fingers open. He knows everything I think. - Point to brain. He knows when I leave and when I return - Walk forward and then turn around and walk back. And he knows all my concerns. He knows every word I'll say - Point to mouth. And every thing I'll pray - Place your hands together. He is in front and in back - Point to the front then turn around and point to the back. He lays his hands upon me - Put hand on self. Oh, how wonderful he can be! - Raise arms in praise. ©2010, Digital by Design, Inc. - See Copyright Information - Do not publish a copy of this Rhyme anywhere on the web. Have one child stand in front of the room for 15 seconds. Tell the other children to look closely at the child and try to remember everything they see. Have the child step outside while you ask a question about him or her. Say, "God searches us and knows everything about us. He knows what color Brad's shoes are; do you?" Pick a child to tell you what color his shoes are. Once he or she has guessed call the child back inside so that the children can see if the child was correct. Pick another child to stand in front of the room. Keep playing until all the children who want to play have had a turn. Sing to the tune of "London Bridges"
Have two adults or helpers stand facing each other holding hands with their arms held high forming a bridge. As you sing the song, have your children walk underneath the bridge and back around again. When you get to the last phrase, the helpers should bring their hands down and capture the child that is walking under the bridge with their arms while singing that child's name. Keep playing until you have captured all the children. ©2010, Digital by Design, Inc. - See Copyright Information - Do not publish a copy of this song anywhere on the web. (This is one of two lessons on Psalm 139. 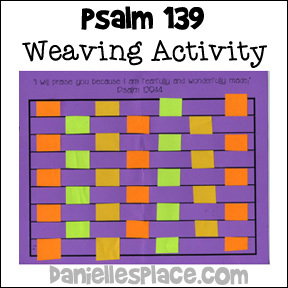 See "You Are There" Sunday School Lesson for Psalm 139 Page for more details about this lesson.